Sure, abs are great and all for about three seconds. Then, you realize that you have to eat a kale salad for the rest of your life to actually keep them. That’s when the dad bod comes into play and seems VERY tempting. How does wings, beer and good company sound? Pretty good, I bet. Well, these actors have all made the right decision by joining the dad bod community and it’s the most liberating decision they’ll ever make. When you go through this article, look how happy they all are knowing that they can be flabby and fantastic all at the same time? This picture blew up the internet for about a month, and it’s easy to see why. Leo became a teen heartthrob when he starred in Titanic and looked pinup-worthy in The Beach. Nowadays he’s looking like he’s decided to eat a little bit more bread then kale salad and it’s hard to blame him. It really won’t make a difference considering he’s THE biggest bachelor in Hollywood right now and women basically throw themselves at him. This is kind of a cop-out addition to this article. He was certainly rocking the dad bod during his time playing Jim in The Office, but he went full Rambo mode when he starred in Tom Clancy’s Jack Ryan. He has since come back down to reality and embraced his slight dad bod. He still has SOME remaining muscle but that should be gone within the next couple of months. This one is for all of the American Idol, X-Factor and America’s Got Talent fans out there. Y’all know that Simon Cowell is rocking the ultimate dad bod. How? Because he wears shirts that are so tight you think he might be going scuba diving afterward. Chris Pratt has kind of been all over the place with his dad bod. Does he even enjoy it for what it’s worth? He had a lovable dad bod when he first joined Parks & Recreation, then he went all ripped for roles in Guardians of the Galaxy and The Lost World. He’s now back to being dad bod Pratt, and hopefully for the rest of his life. He was missed. When you think of the superhero Ant-Man, you probably don’t think of anything other than, uh, ants. But, when Paul Rudd took his shirt off in the movie Ant-Man, it showed off the fact that he spent a lot of time in the gym. One of Seth Rogan’s first major roles in film was as an accidental and expectant father in Knocked Up. It appears that he gave himself a dad bod to really look the part and he hasn’t looked back since. Rogan is one of the steady dad bod guys who we can count on to ALWAYS be on the team. He’s not afraid to show it off either. We love us a proud dad bod. 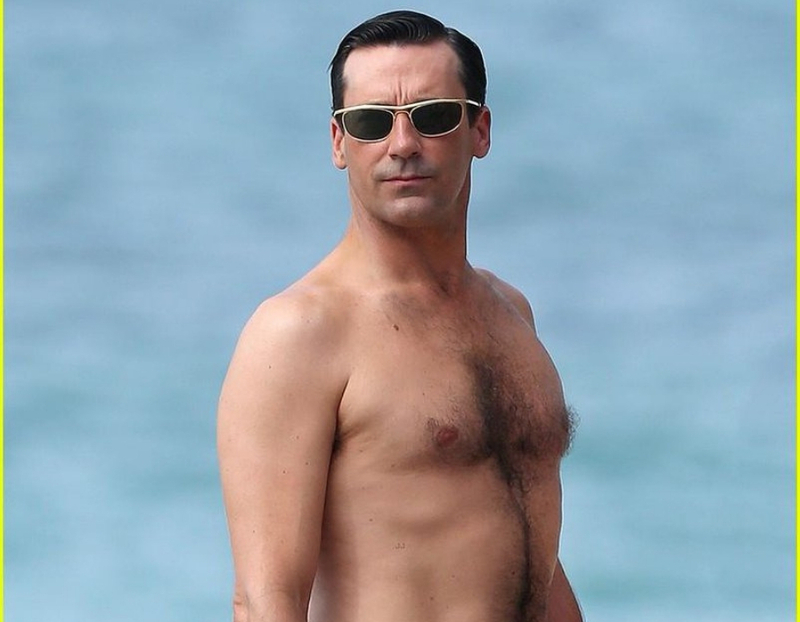 Can we just go ahead and anoint Jon Hamm the king of the dad bod? Let’s just stop beating around the bush and do it. He doesn’t usually draw attention because of his physique, but if you respect some flab with an athletic build, you’re going to love Jon Hamm. He mostly makes his news by cameras catching pictures of his “hammiconda” as it peaks through his pants and shorts. Adam Devine is someone who should be a public advocate for dad bods. Why? Because he’s boyfriend material and gets attractive women even though his body tells us he’s probably very comfy to nap on. He’s tweeted, “59% body fat. I am human stuffing” and there hasn’t been a more relatable tweet since. He’s not only rocking a dad bod, but he’s also self-deprecating, who couldn’t love that combination? Perfect. When Vince Vaughn came onto the acting scene, he was a lean and mean hunk in Swingers back in 1996. Since then, he has fully embraced the dad bod and we love every second of it. It’s safe to say he looked less lethal in True Detective and in other comedies like Couple’s Retreat. 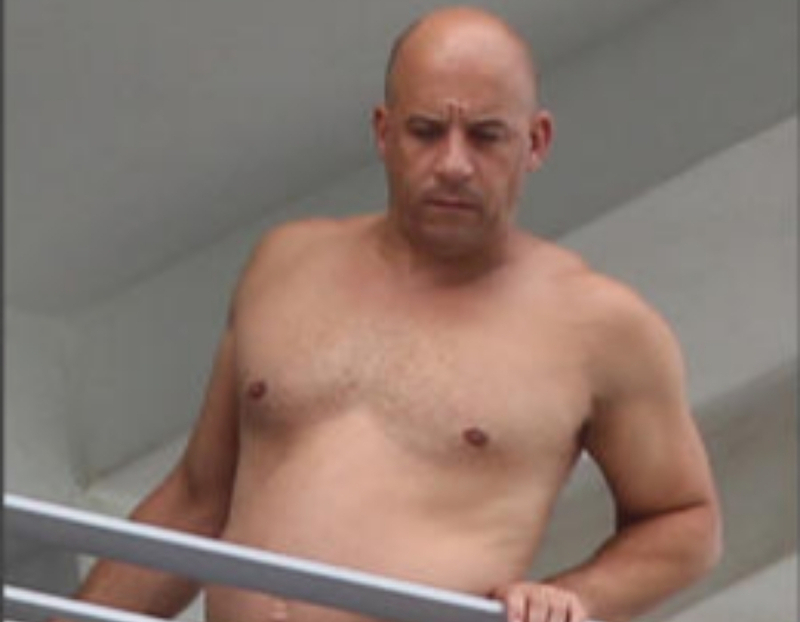 If you’re going to adopt the dad bod, you have to go full dad bod and embrace it entirely like Vince. You might be surprised to know that Jason Segel was once a handsome young guy when he started out in movies like Dead Man on Campus. Now, he still gets leading roles, but most of them are in romantic comedies where he plays a man who is down on his luck both physically and mentally. The good news is that he’s one of the funniest actors around, the bad news is that he’s a little softer around the middle. Alec Baldwin went from Miami Blues to dad bod. Most people forget that he once was a stud onscreen. Now, most people just see him on Saturday Night Live playing President Trump and he’s looking quite bowling-ballish. 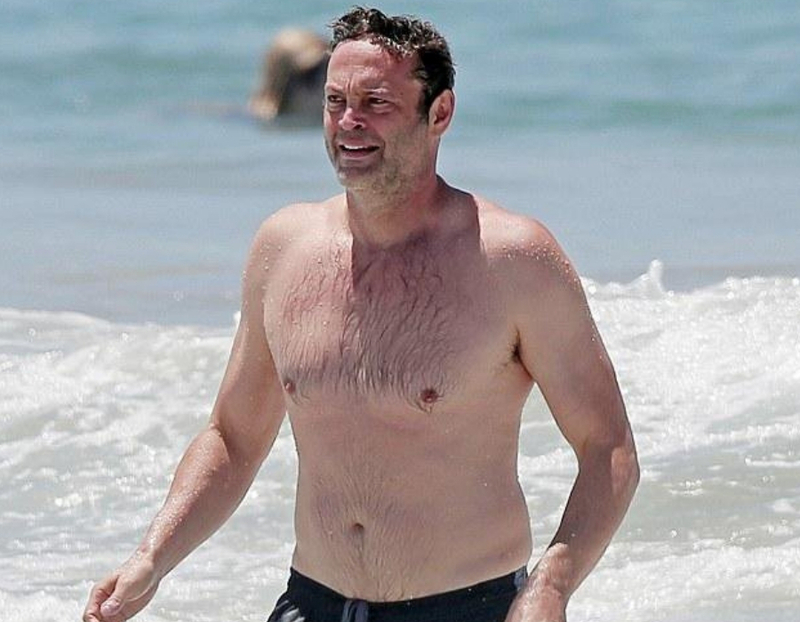 It’s probably safe to say that he’s been a member of the dad bod community ever since he left 30 Rock. We’re not worried about him going anywhere. Jack Black has embraced his chubbiness and turned it into a money making machine. Look, not every actor in Hollywood needs to look like they’re hand molded by statue makers. Sometimes you need the dad bod to neutralize a scene and make it more relatable. That’s exactly what Jack Black has done and it’s worked very well. 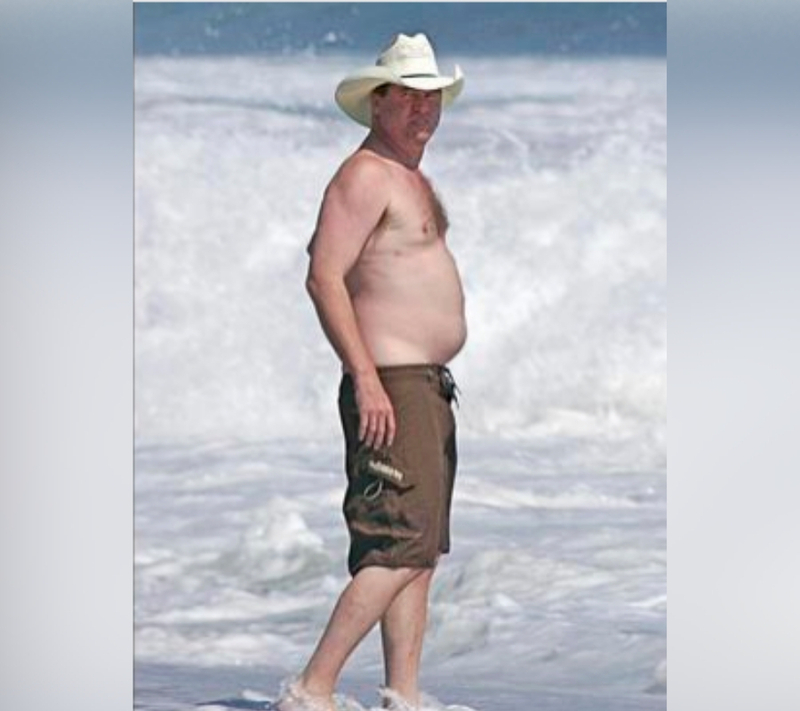 He’s shown the world since the 1990s that dad bods are all the rage. 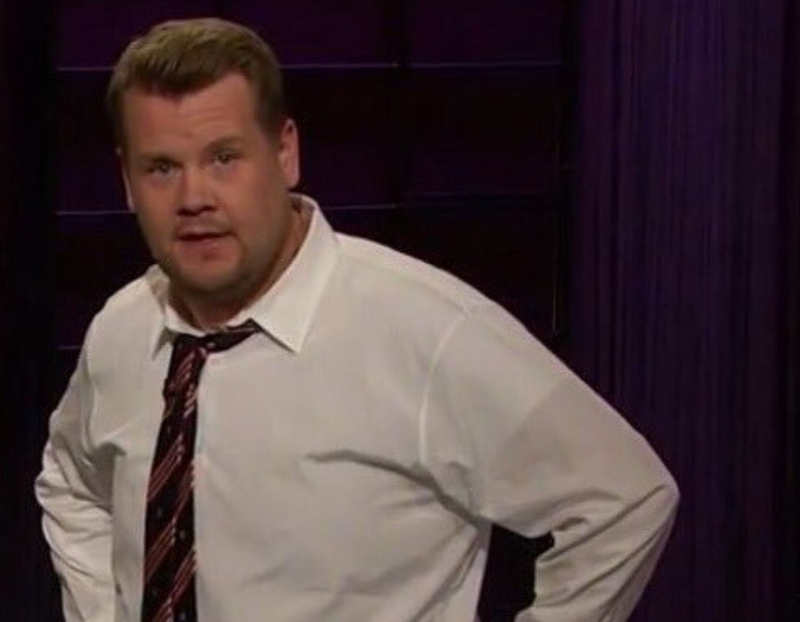 James Corden needs to be celebrated. Not only is he very proud of his dad bod and shows it off all the time on his late night show, but he’s also the only dad bod that’s ever been willing to stand next to David Beckham in underwear. Yes, they did an underwear advertisement together and the dad bod community lost their minds. He was the first, and only person to achieve that feat. Adam Sandler has never really had an athletic build, even in his earlier years at Saturday Night Live. But, the funny man did have a few moments on the big screen where he at least showed some muscle peeking through. 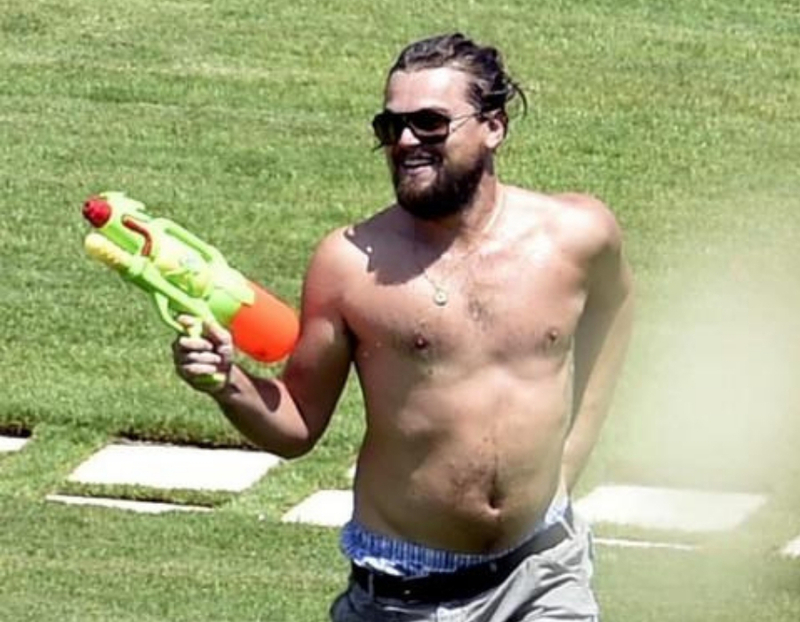 He’s basically been the poster-dad for the dad bod in Hollywood and we’ve all accepted it. We know what we’re going to get when we see the Sandy-Man go to the beach. Okay, Bradley, we see you. Look, the dad bod community has been torn on Bradley Cooper. Sometimes he looks like he should be on the cover of Men’s Fitness while other times he attempts to join the dad bod community. This is about as flabby as he gets, and it’s hard to determine whether he should get a pass or not. Maybe he should just stay in his own lane and let the rest of us enjoy our bodies. 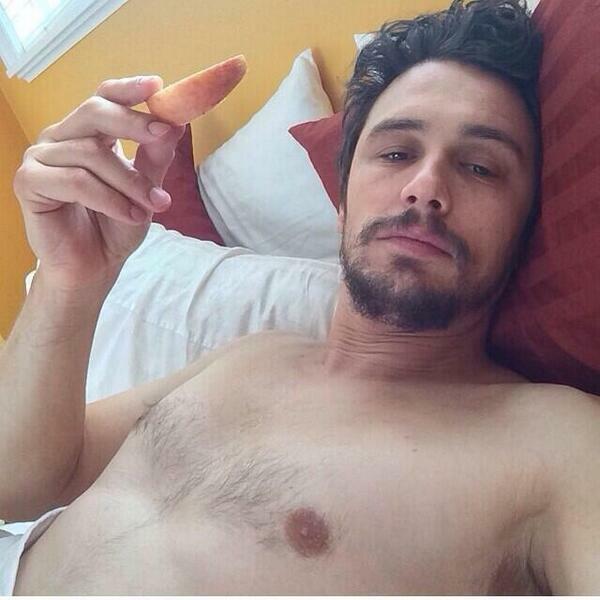 James Franco has been a Hollywood heartthrob for years. The problem is, his chiseled face and physique from the beginning of his career didn’t follow him to where he is now. But, that hasn’t stopped fans’ lust for him. He’s been working the dad bod pretty effectively by the looks of it. These bizarre selfies that he takes showing it off act as advertisements for the dad bod lovers to froth from the mouth uncontrollably. 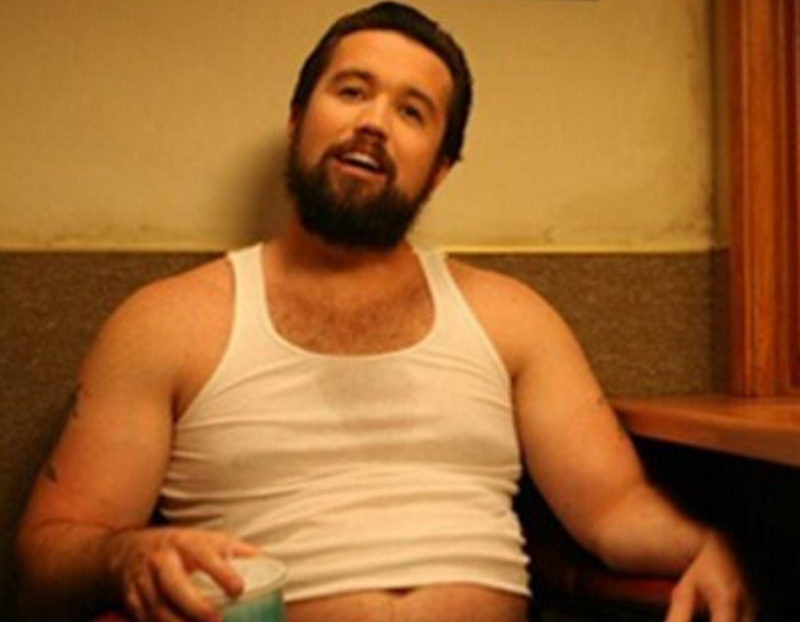 You might not believe this, but Rob McElhenney actually developed a dad bod for his role in It’s Always Sunny in Philadelphia. If he doesn’t realize it now, it’s the best decision that he could’ve made. Can some fitness freak sit around at a bar and eat buffalo wings all day while crushing two pitchers of beer? Nope. Can a fitness freak walk around with their gut hanging out without getting weird stares? Nope. If you’re looking at this picture and aren’t feeling intimidated at all, you’re not alone. 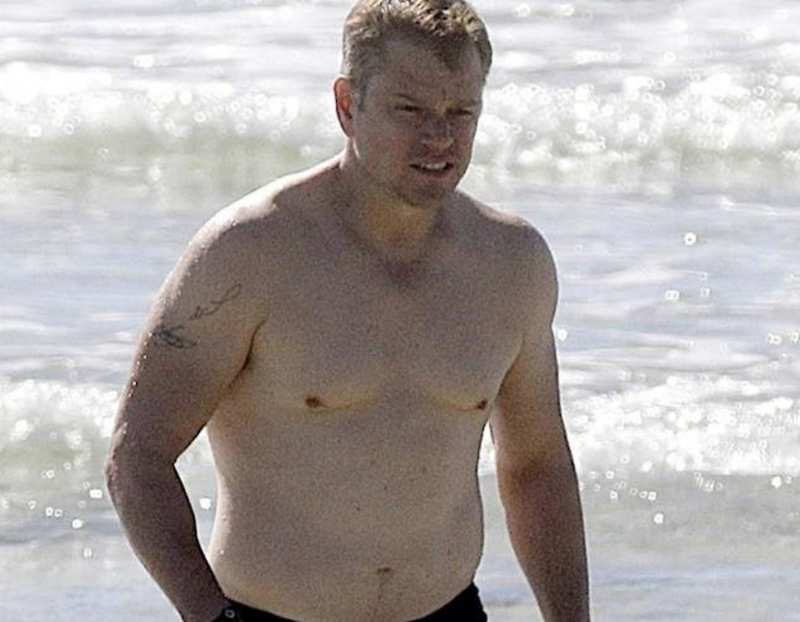 But, there was a point when he was working on the Bourne movies and was in tip-top shape. It’s probably safe to say that this “fluffy” Matt Damon couldn’t do half of the stuff that Jason Bourne could do, but that’s just speculation. It looks like he’s embracing the dad bod in preparation for being a real-life dad. 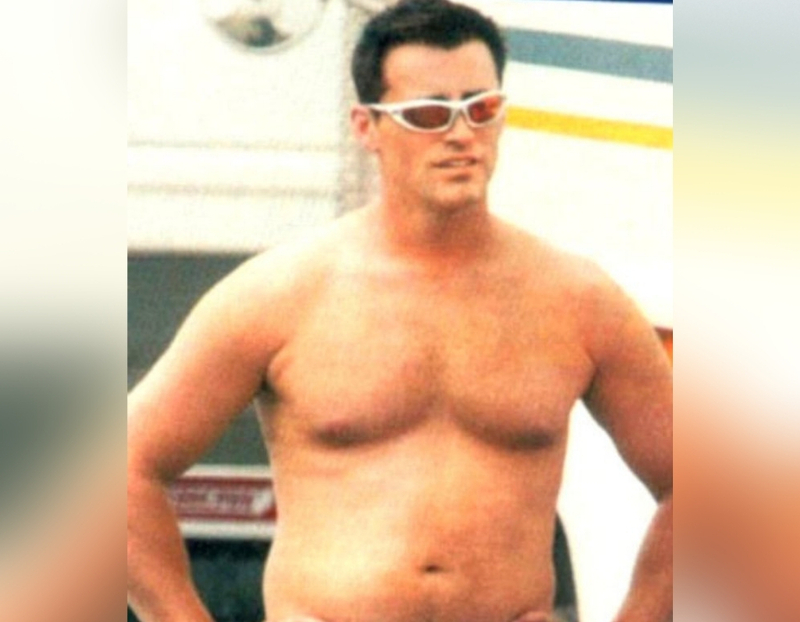 If Matt LeBlanc’s actual eating habits are anything like his character Joey from FRIENDS, it’s no surprise he’s rocking the dad bod. Joey could eat three consecutive pizzas in a row and by the looks of it, so can Matt. Nothing wrong with that. First of all, that’s enjoying the little things in life. People who work out can’t do that. What kind of life are they trying to live? This picture should make every person in the dad bod community feel very good. One of the most beautiful women in the world is married to someone with a certified dad bod. Jay Z isn’t afraid to show it off on his many beach vacations with Queen Bey. People need to be aware that some of the best looking women in the world still enjoy a good dad bod. We’re here to help. A lot of people try to hide their dad bod. It’s very degrading to the rest of the dad bod community who feel like they don’t have a good enough physique to show off. Will Ferrell has been fighting the good fight in Hollywood. He’s never been ashamed to share his dad bod on the biggest screens in the world. He’s the father of three children so maybe it just comes with the territory. Okay Jason, we see you. Not only has he gone full dad bod, but he’s also trying his hand at playing Chewbacca in the next Star Wars movie. 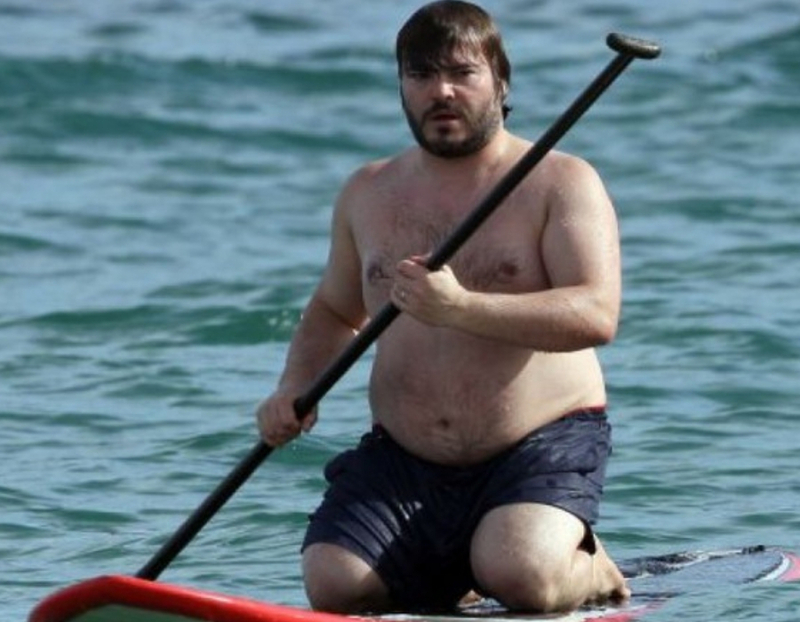 If a certified dad bod played Chewy, that would be the most progressive role the dad bod community has ever had. Sudeikis recently became an actual father to his son Otis with actress Olivia Wilde. He’s getting up there on the dad bod spectrum. If you’ve ever seen the Fast & Furious franchise you’re very aware that Vin Diesel was VERY buff. He was not someone you’d want to run into in a bar fight. Now, he’s looking like the person you’d beg to try to fight you at the bar. In-between movies, he’s been known to lay off the gym regiment and just enjoy life for all its wonderful carbs, sugars, and ice cream. 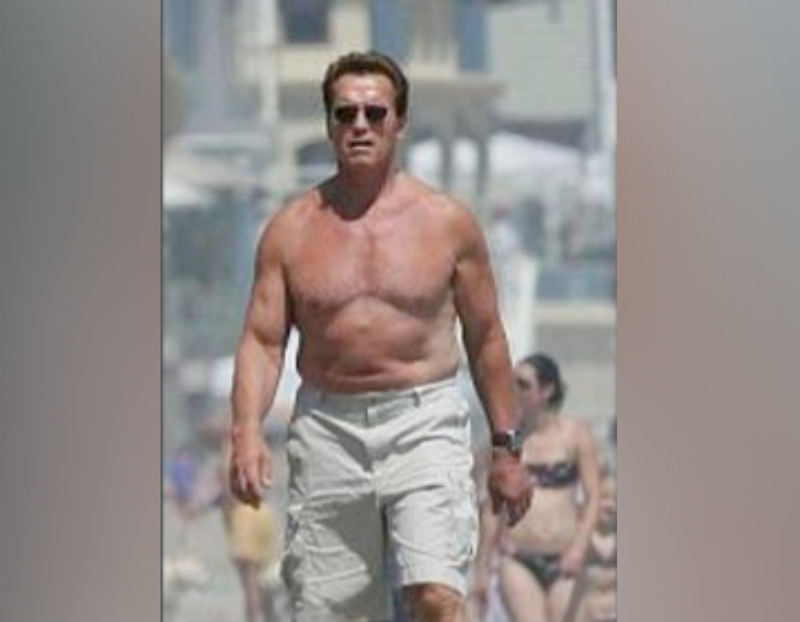 Arnold Schwarzenegger is the former world champion bodybuilder turned Terminator, turned governor, turned dad bod connoisseur. If you looked at him back in the late ’80s, or when he played Conan, you would never believe it was even possible to be flabby. He didn’t have an ounce of body fat on him and looked like he could pick up a car with his baby toe. It looks like several hard years as a governor has probably softened him up a bit. This looks like a before and after picture. If your before picture looked like Zac Efron, you’re doing well for yourself. But, Robert De Niro has been leading the dad bod charge for a while now. People forget that he was incredibly cut in movies like Taxi Driver and Raging Bull. Now he kind of looks like a melting vanilla ice cream cone but in the best way possible because it’s frickin’ Robert De Niro. The movie 300 solidified the fact that Gerard Butler is a really scary dude. Not only is he incredibly buff in that movie, but he’s also, just, uh, scary, for lack of a better word. By the looks of it, in real life, King Leonidas couldn’t intimidate a little mouse while wearing a cat costume. He’s gone full dad bod and there’s absolutely nothing wrong with that, it’s “trendy.” Just ask the other guys on this list. Remember Iceman from Top Gun? This is him now. We have to respect the dad bod hustle. It would’ve taken a lot of effort to go from being cast as the Dark Knight in Batman Forever to looking like a dad who is only at the beach resort for the buffet. This is what we live for and the dad bod community is very excited to now have Val officially in the club. 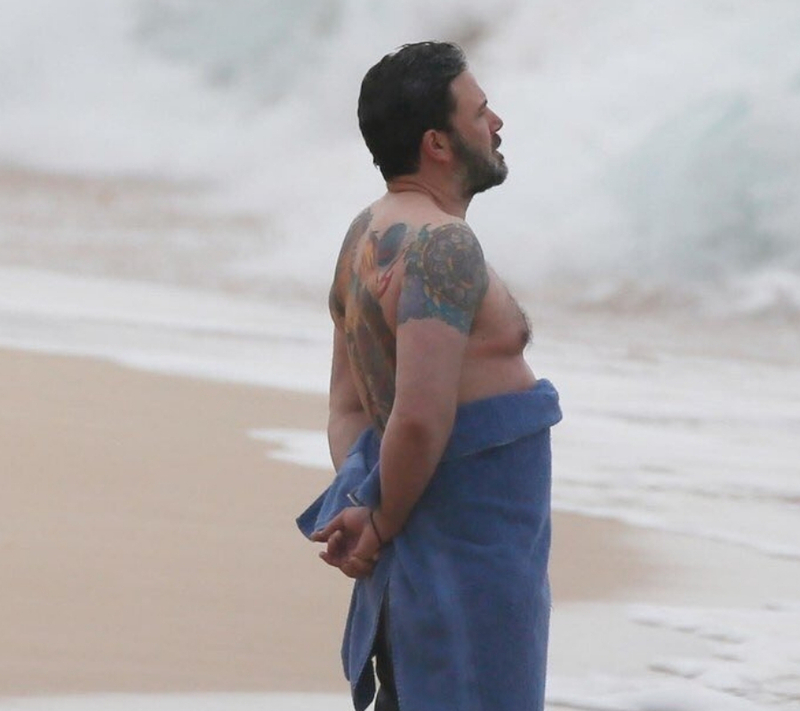 Ben Affleck has had some substance abuse problems in his past. But, he also used to be ripped. Not only did he have to hit the gym every day to become Batman, but he also got pretty fit for Argo as well. Since then he’s been rocking the dad bod and doing it very well. This beach picture also gives us some insight into the crazy amount of tattoos that he has all over his body. 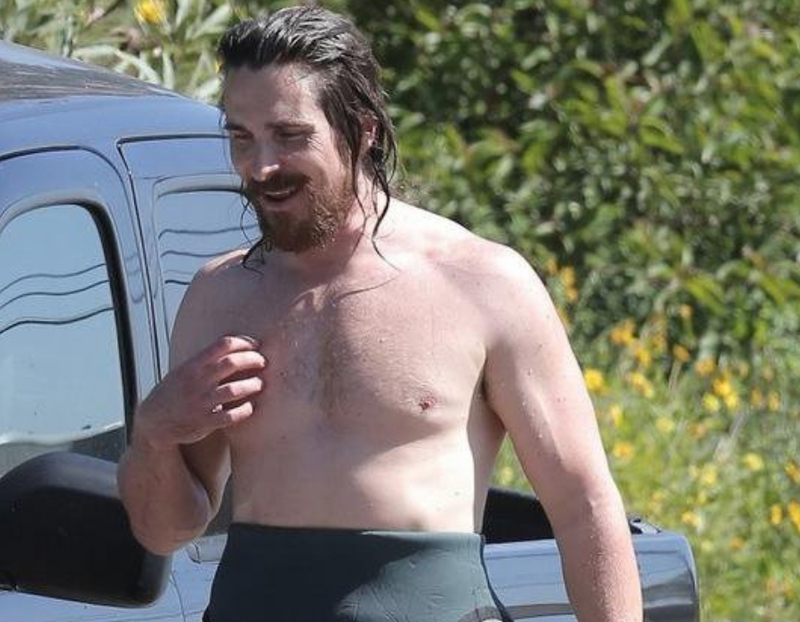 When you’re a method actor like Christian Bale, your weight is going to go back and forth between looking super ripped, scary thin, and just full-on dad bod depending on the role. The difference between American Psycho Christian Bale and The Machinist Christian Bale is night and day. But, when he doesn’t have any roles to play, he goes full dad bod and loves every second of it. We don’t blame him. Eli Manning will forever be known as “Peyton’s little brother.” It must be tough to be Eli (well, not really but let’s pretend) because he’ll never get out of his brother’s shadow. There’s no way he’ll ever be a better quarterback than his Hall of Famer brother. But, one thing he does edge out his brother in is in the dad bod category. 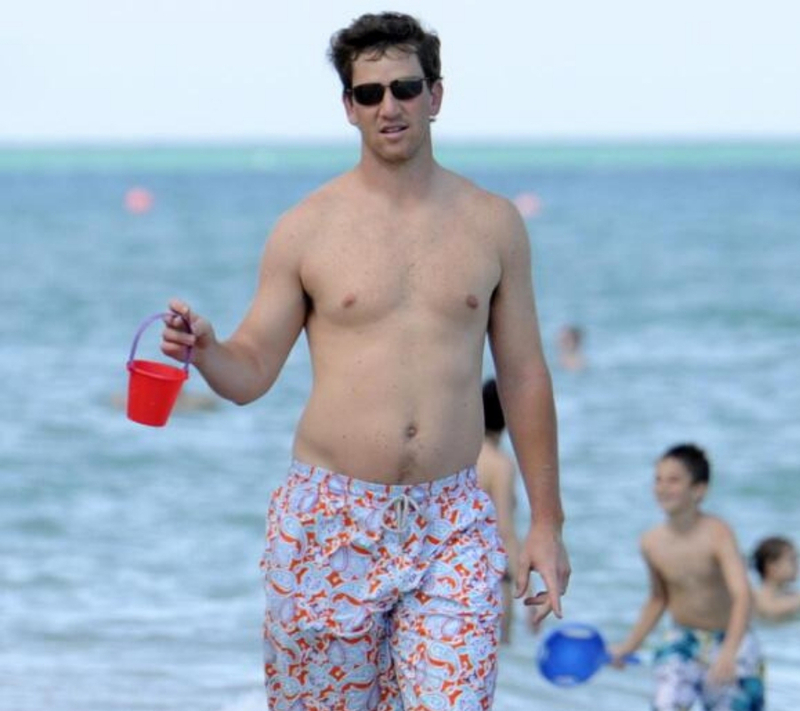 Eli has one of the greatest dad bods of all time for an athlete that’s STILL playing.